Honey Gold is a bit odd-looking: she has white flowers with yellow hearts. This 'fried egg' with its cheerful personality fits perfectly into summery bouquets. 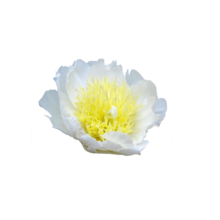 Honey Gold is a single-flowered, white peony. The bud is white and modest, but once it starts blooming, it undergoes a identity change. The big, yellow and festive heart looks cheerful at its peak. No wonder the flower often gets compared with a fried egg. Honey Gold was created by Klehm. He introduced her in 1970. The flowers are white in the bud and have a bomb shaped, yellow center while in bloom. Besides this peony, Klehm has shaped Colonel Owen Cousins. Because of her light-hearted and open character, Honey Gold is not a dramatic peony. She fits better into summery bouquets: she sets the tone, but stays in the background. That’s why she matches other kinds of flowers flawlessly.